According to current research, companies founded by men received more than 16 times the amount of funding that companies run by women received in 2016. There is additional evidence that points to an existing gender bias when raising venture capital. In particular, VCs ask male and female entrepreneurs different types of questions, which may ultimately affect their decision to invest. The communication challenge that I am trying to solve is the gender inequality inherent in receiving, and accessing, venture capital funds for technology startups. 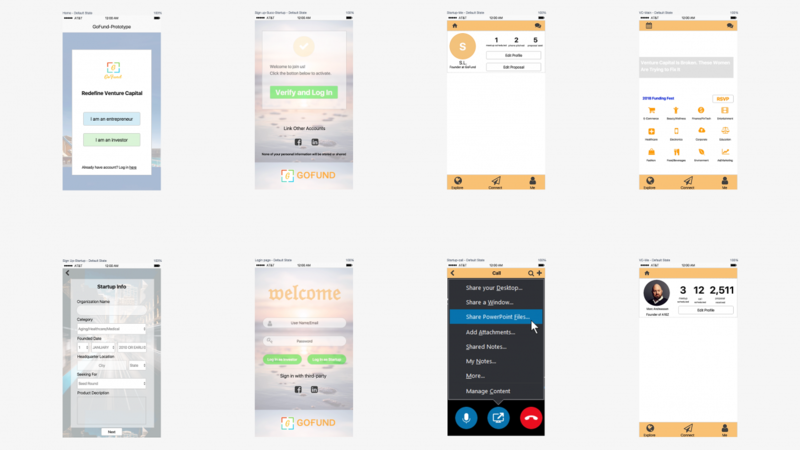 In my project, I built a prototype of a gender-neutral mobile app, GoFund, that eliminates the gender dimensions in its product design. Only the initials of the entrepreneurs will be displayed to VCs, and voice modulation will be applied to call meetings. To improve the efficiency of the process, while also ensuring the credibility of the users, both VCs and entrepreneurs need to verify their company email addresses before registering with the app. There is also a daily limit during which entrepreneurs must submit their business proposals. The intent is for VCs to focus on the ideas being presented first, before meeting those who are pitching their business plans.